A blessed month of Ramadhan to all; May peace and blessings of God be bestowed upon you. As The Holy Month of the revelation of the Holy Qu’ran begins, I wish to share what my experience will be fasting in my small town as well as some goals and hopes I have for this Holy Month. First, let me ask for forgiveness for my shortcomings and thank God for allowing me to see another Ramadhan. As most of you now know, Ramadhan is a personally special time for me as the Greatness of God and Islam was revealed to me through the act of fasting during Ramadhan 2009. I then studied greatly for 3 years and proclaimed my faith in One God and belief in His prophet Mohammed during Ramadhan 2012. Two years later, I find myself far from where I first learnt about Islam and devout of a Muslim partner or Muslim community–my faith, however, is still strong of God’s love and guidance. 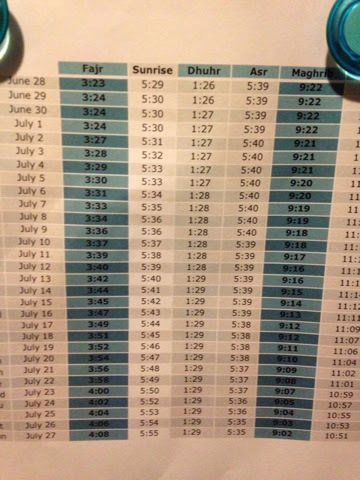 As every year when Ramadhan is in the summer, the fasting hours will be long. In my community, the fasting days will last an average of 18 hours. As I am currently on medication, I will attempt to fast full days but will have to modify the schedule if my medication was to react negatively with the fasting. It’s difficult to image a Ramadhan where I am not able to connect with God through fasting. With that said, I have taken to, once again, read the Qu’ran in it’s entirety and hope to be sharing passages with you throughout the holy month. My goal is also to accomplish all 5 daily prayers, which I must admit I have failed to do during the year. I also hope to visit neighbouring Muslim communities and do some prayerful isolations at neighbouring mosques as there are none in my locality. Lastly, I hope to do some charity work or donate funds from small money-making endeavours. If by my example, I can inspire believers to strengthen their own relationship with God, I pray and hope that this Ramadhan will help me find my own inspiration. May this Holy Month provide you with strength and solace.